The NEAR (Near Earth Asteroid Rendezvous) mission was the first in NASA's Discovery program of "smaller, faster, cheaper" missions, formally started in 1994 under new NASA Administrator Dan Golden, though it reflected a fundamental change in NASA budgetary and programmatic philosophy under the George Bush Sr. and Bill Clinton administrations, and which continues to this day under George Bush Jr. The purpose of the Discovery program is to design a series of low cost spacecraft, each at a cost within $190 million of development costs and another $100 million of mission costs, and a time frame of 3 years from design to launch. It meant major cuts in porkbarrel NASA spending, though private operations such as SpaceDev can still cut costs a lot more. NEAR was launched successfully on February 17, 1996. The main goal of NEAR was to be the first probe to orbit an asteroid. The near-Earth asteroid Eros was chosen, as it's a large asteroid and is more economically accessible than other large asteroids (though there are more accessible small asteroids). Eros is an elongated asteroid about 40 km x 14 km x 14 km in size. The orbit around the asteroid was complex, and this was our first experience in orbiting an asteroid. Eros arrived at the asteroid on Valentine's Day in the year 2000, and continued studying the asteroid for approximately a year. In the end, Eros landed on the asteroid, even though it was not designed to land. The mission was a resounding success. Eros, two views, both sides. Photo by NASA and JHUAPL. Also of note, the NEAR probe was renamed the NEAR-Shoemaker probe, after the late Dr. Eugene Shoemaker, a leading asteroid research pioneer who died in 1997 in an automobile accident while visiting impact craters in the Australian outback. 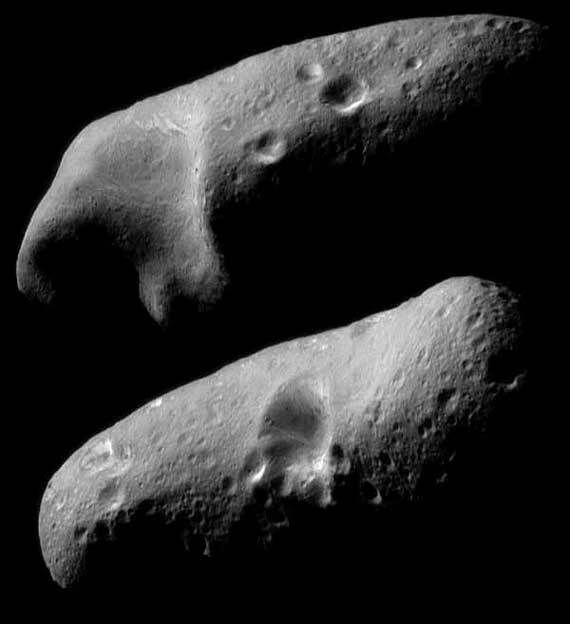 Eros is one of the largest near Earth asteroids. Yet, its escape velocity is only about 22 miles per hour (35 kilometers per hour), i.e., a child could easily throw a rock off of it. 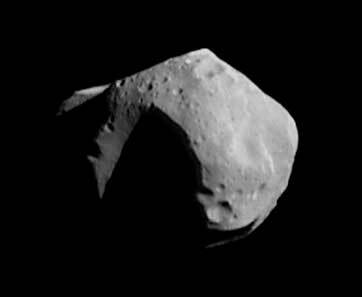 Eros is an S-type asteroid with composition varying over its surface, and a rotation rate of 5.27 hours. En route to Eros, NEAR did a close flyby of the asteroid Mathilde on June 27, 1997, pictured on the next page. Mathilde has a maximum diameter of 53 kilometers (33 miles) which made it the largest asteroid visited by a spacecraft. A one ton object on Earth would weigh the same as 2 kilograms (4 pounds) on this asteroid. It also has an unusually long period of rotation, at 17.5 Earth days. The closest approach was around 1200 km (750 miles) which was the closest approach to an asteroid made by any spacecraft to date. Mathilde is one of the darkest asteroids we know of, reflecting only 3% of sunlight. It is twice as dark as charcoal. It is a C-class asteroid and thought to be very rich in carbon. Its density is roughly that of ice, which is about half the density scientists had expected before the encounter. Its color is extremely uniform, and the density of craters indicates its surface has been exposed for several billion years. This indicates it was never part of a large parent body which underwent gravitational differentiation. Scientists find it amazing that Mathilde is still intact after such huge impacts. It's almost more crater than body space. Also remarkable is its uniformity in composition, judging from its lack of color variation. Mathilde is pictured above, the largest crater is more than half the width of the asteroid and 5 kilometers (3 miles) deep. The NEAR probe manufacturer has a webpage on the Mathilde encounter. Mathilde is not very economically attractive due to its distance and the energy that would be required to land on it, even though it seems to be volatile rich. On the other hand, Eros is economically accessible from a transportation standpoint, but Eros is not very attractive in terms of what it's made of. While we really don't know very well what it's made of, even after NEAR's visit, we do know in general that Eros is a bright, rocky body that is probably poor in volatiles, though we really don't know what's under the uniform surface. Its material is twice the density of Mathilde's. It apparently formed in the inner solar system (not a captured comet), is made of primitive materials, is fairly uniform (undifferentiated, chipped off of a body that did not separate into core, mantle and crust), has not suffered catastrophic collisions, hasn't melted, and is consolidated in that it's held intact by its internal material strength. (In contrast, many asteroids are thought to be rubble piles from impacts, and others are burnt out comets with a sealing crust.) Eros is like a soft rock that's cracked but not broken. Lots of grooves and cracks, but intact. We know the surface composition, but not the subsurface. However, in places where there has been recent shifting of material, such as on cliffs, the underlying material is brighter. It is an ordinary chondrite consisting of both heavy and light materials, never subjected to intense heating. The home page for NEAR tells everything, at near.jhuapl.edu.